Impress your friends with these factoids about the productions of 2017's DCI World Championship finalists! Then, re-live all of those performances from last August which are now available on Blu-ray, DVD, or digital download. The use of in-ear monitors by the Bluecoats drum line and front ensemble percussion section allowed the corps to stage performers at wide intervals that would have made it otherwise impossible to play together. During a feature in the first half of the production, the five-member tenor drum section stretched across 20 yards, while front ensemble percussionists were grouped in pods across a whopping 50-yard section of the field. As a central theme to the production, Blue Knights' "i" included more references to eyes than you'd find at an optometrist. Perhaps most notable was that on the performers' uniforms, with each section of the corps featuring a different eye color just as the human iris comes is various pigmentations. Even with a daring new look unlike anything seen before, the Madison Scouts' iconic fleur-de-lis could be found in abundance throughout "The Last Man Standing." Look for it in the tribal spear prop in the middle of the field, on the front of headdresses worn by performers, and on the left shoulder of the costumes directly over where traditionally many of the corps' members get fleur-de-lis tattoos. Celebrating 60 years in 2017, "Metamorph" was bookended in throwbacks to the Blue Devils' past. A bell lyre from the ensemble's origins was seen at the top of the program, while color guard members at the end of the production featured the corps' iconic "wings," a creation of DCI Hall of Fame color guard designer Shirley Dorritie that has been featured numerous times over several decades. The Cadets' 2017 season marked the first of a three-year deal the corps has with the Leonard Bernstein Office to serve as an ambassador during the centennial celebration of the composer's birth. The "stained glass" prop sets the corps utilized at the back of the field were originally intended to just be decorative. Later in the season they became an integral visual effect in the final transformative moments of the production. Gustav Holst's "Mars, the Bringer of War" was an obvious choice to accompany the Cavaliers' 2017 production. Often subtly, the well-known eight-note rhythm was threaded throughout the entire production, heard in the brass and percussion parts more than two dozen times. 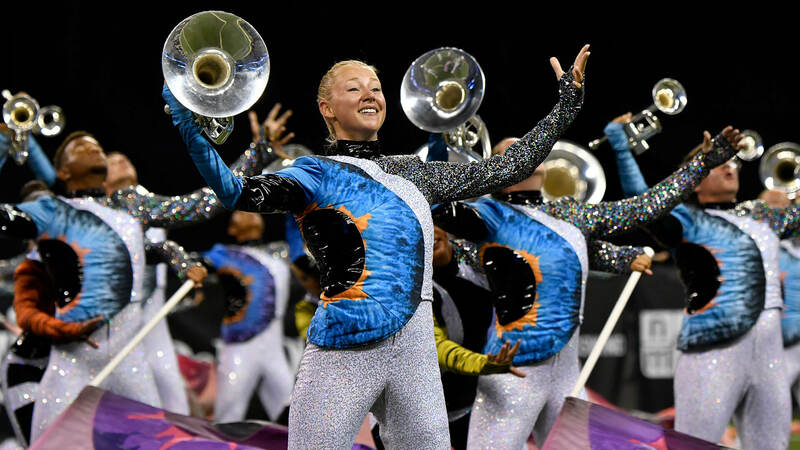 Themed on deconstruction, Carolina Crown tore apart our preconceived notions of a drum corps show figuratively and literally. Musical works that were never allowed to be completed by the corps set the deconstruction in motion in the first half of the program. At the end, camouflaged field coverings that were specifically created for World Championships Week were strewn about by corps members making it look as if they were tearing up the Lucas Oil Stadium turf. Themed on the struggle that artists often experience with the creative process, the brightly colored character who appears in the final segment of Crossmen's "Enigma" represents the light bulb turning on in the artist's mind—a eureka moment to break through the creative setback. To create the look of faceless phantasms, Phantom Regiment color guard members wore a sheer red fabric over their heads. While the coverings were see-through to some degree, they created a unique challenge for color guard members as they spent the season practicing rifle tosses, flag spins and other maneuvers to perfect the more than five minutes of the production that they performed with diminished sightlines. One of the most memorable moments of the entire 2017 Drum Corps International season, Boston Crusaders utilized special chemicals with a fog machine to instantly dissipate the "smoke" that surrounded the flames as color guard members met their untimely demise. "Star Crossed" was filled with music from three Baz Luhrmann movies about star-crossed lovers; "Romeo and Juliet," "The Great Gatsby," and "Moulin Rouge." The color guard costumes were inspired by each of the films, as were male and female characters who were kept apart visually by reappearing "X" forms in the drill. Santa Clara Vanguard - "Ouroborous"
The 12 brass virtuosos who wore silver and gold uniform tops were meant to represent the 12 settings in the life cycle of an ouroboros, the fabled snake that consumes itself.